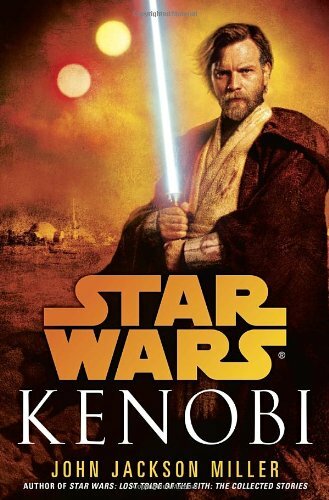 Star Wars Book Review "Kenobi"
Kenobi. What a simple title for a book about one of the greatest Jedi of all time. Kenobi. One word, yet it conveys so much. This recent addition to the pantheon of Star Wars literature by John Jackson Miller gives us the story of Obi-Wan in the immediate aftermath of Episode III "Revenge of the Sith." We already know from that movie that Obi-Wan Kenobi has taken it upon himself to watch over Anakin Skywalker's son, Luke. Anakin, who was Kenobi's fellow Jedi and brother-in-arms, was turned to the dark side by Darth Sidious, who is now the Emperor of the galaxy. Anakin, who took the name Darth Vader after his turn to the dark side, was defeated in a lightsaber duel by Obi-Wan and was left to die on Mustafar. Knowing the Emperor would search for the offspring of Vader, Master Yoda and Obi-Wan decide to hide Luke with his step-uncle and aunt on the Outer Rim planet of Tatooine. Kenobi vows to watch out for the boy's safety until such time he is ready to be a Jedi. If you are only familiar with Obi-Wan from his appearances in the original trilogy of movies, this book may not resonate with you. However, if you are a fan of the prequel trilogy, and especially the animated series "The Clone Wars," then this book will give you a powerful insight into the mind of Obi-Wan as he comes to grip with what has happened to his world in the past few months. You can almost feel the sadness rolling off of him as he interacts with his new surroundings. Vowing the life of a hermit, his one goal is to watch after Luke. What could possibly be difficult about that? As it turns out, it is incredibly difficult. Owen Lars, Luke's uncle, does not like "Ben" (Obi-Wan changed his name) hanging around too much. He feels the Jedi will attract trouble and interfere with his farm. Obi-Wan relents and moves to the far side of the desert. Finding an empty house, he begins the process of making it into a home. From here we are introduced to the rest of the dramatis personae. Annileen Calwell, a general store owner, and her two children Jabe and Kallie. Orrin Gault, a moisture farmer and something of a town leader. His two kids Mullen and Veeka. A'Yark, Tusken raider and clan leader. That's right, I said Tusken. Sandpeople. What story set on Tatooine would be complete without Sandpeople? The story continues on with Annileen playing the part of the strong, yet vulnerable, pioneer woman. Orrin plays the part of the self-important rancher and A'Yark is the Native American with strange customs and traditions that keeps the Tuskens locked in conflict with the settlers. The author states in his acknowledgments that this novel was intended to be Star Wars as a western and he suceeded in translating this genre into a galaxy far, far away. I won't give away the plot, and really, the plot is secondary to Kenobi's adjustment to post-Jedi life. He exudes sadness and loss through the whole story yet still finds the strength to act when needed. If you are a Star Wars fan, especially a prequel and Clone Wars fan, this book will help you bridge the wide gap between episodes III and IV. I recommend you pick it up and read it soon as the next Star Wars novel lands in early October and will be centered around Luke's sister, Princess Leia.